This Saturday, 30 September is International Translation Day, which is celebrated every year on St Jerome’s feast day. St Jerome might be one of the most famous historical translators, due to his influential Bible translations in the 4th century. He was commissioned by Pope Damasus to translate the Bible into Latin; this version later became known as the Vulgate. It was declared the official Bible translation in the 16th century and was in use until the second half of the 20th century. 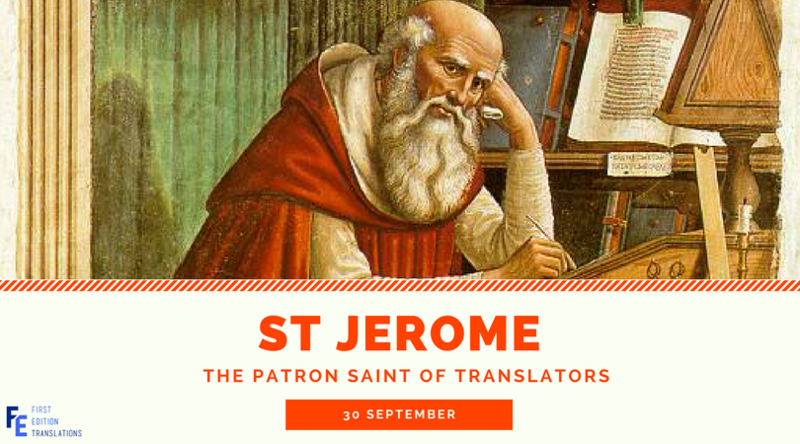 In addition to his Bible translation and religious notes, St Jerome is also well known for his commentaries on translation. One of the motifs that often comes up in his letters and treatises is the question of verbatim, word-for-word translations. As an answer to his critics who accused him of deviating from the source text, he stated that when translating, he “render[ed] sense for sense and not word for word”. He argues that if he translates “word for word, the result will sound uncouth, and if compelled by necessity [he alters] anything in the order or wording, [he] shall seem to have departed from the function of a translator”. This is a dilemma that translators still face more than 1500 years later. It is a fine line translators must walk and their decisions are influenced by many factors such as the purpose of the translation, the subject matter or the client’s specific instructions. There are certain cases when they have to opt for more creative solutions, for example when translating idioms or slang. Also, when working on advertising slogans or children’s books, translators might also need to put snappy solutions above accuracy. In these situations, however, any changes to the source text are discussed in detail with the client to avoid any misunderstandings. Literal translations are often necessary, for example for medical or legal translations where even the slightest change to the source can have undesirable results. If you have any questions about a translation project or how we and our translators work, please do not hesitate to get in touch by emailing enquiries@firstedit.co.uk or by calling 01223 356 733.